To anyone who has been stranded, immobile and silent on the side of a busy interstate, the whoosh of passing cars and the blasts of air from speeding tractor trailers rocking your vehicle is familiar. You sit in your crippled automobile on the verge and you change not a whit, the traffic that ignores you and continues on its way. I can tell you though, when the stalled vehicle is an airplane, things change completely. Apparently, jaded though the public is, the sight of an airplane beside a busy road is enough to stop traffic. Within minutes multiple cars and trucks had stopped and I had dispatched one volunteer to phone the airport and tell my friend Jake to come to my aid. In twenty minutes or so Jake arrived, a wide smile plastered on his face. Thankfully, with the cell phone still an invention of the far future, the police had not also appeared, and we began to noodle the problem of getting the airplane back into the air. At that time the interstate had recently opened and traffic was a fraction of today's flow. We decided that our plan would be to start the airplane, and then just wait by the side of the road, run up competed, until there was a break in the traffic. At that point I would start my takeoff run and be airborne before anyone could catch up with me. The plan worked perfectly. I've often wondered what the people driving in the other lane thought when the small yellow airplane zipped by, heading north on I-79. Back at the airport I told my story and the crew at the hangar lapped it up and congratulated my on good flying. Secretly I thought there was more luck than good planning involved and I figured that God wasn't finished with me yet and needed me to stay around for more service bulletins to be done on my airframe. In spite of the unscheduled landing I continued to fly the airplane over the next few days. My theory was that the airplane hadn't done anything wrong and I sure wasn't going to repeat my faux pas of the vertical roll. A couple of my friends were qualified to fly the Cassutt, Jake being one, and I gave them free reign to take it up when they liked. One evening after Jake came back from a flight he called me out to the airplane. The first thing I saw was that the large spinner was missing from the propeller. Parts of it were clinging to the back plate, but it had been seemingly wrenched from the prop. Jake had been in level flight at normal speed when the spinner had let go and he said a heavy vibration had accompanied the spinner's departure. After much talk and careful examination of the offending end of the Cassutt, our conclusion was that if the spinner came off, then obviously whoever put it on the last time had failed to tighten the screws that held it in place and that was that. We would order a new spinner and make sure the screws were tight. In the meantime, there was no reason we couldn't continue to fly the airplane, was there? Youth, inexperience and optimism is always a deadly mix, but never more so than in aviation. The stage was set for the final act. Next day a brilliant late-summer sky beckoned me aloft again and I pushed the now spinner less airplane from the hangar. After a careful preflight, I caged a prop spin from one of the mechanics. The engine caught instantly and settled down into its rumbling and unmuffled idle. Confirming oil pressure I started my slow taxi to runway 18 and felt the cool of the rudder pedals on my bare feet. 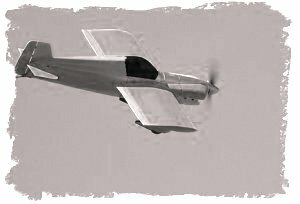 Because of the limited leg room I had been flying the Cassutt without shoes and even then it was a squeeze for my frame. Arriving at the end of the runway, I went through the check list, did the run-up and faced the tower, signaling I was ready. They responded with a steady green light. I lined up on the centerline and slowly pushed the throttle forward. I couldn't get enough of this airplane. I felt like a teenager in love. I was enamored of the performance and the true third dimension that this ship's vertical ability gave to flight. I quickly climbed to 3000 feet and trimmed for level flight. Tonight I would fly south to Barbour County and give my friends at Simpson Airport a look at the Cassutt, with some low passes and other thrilling maneuvers. Leaned and stabilized, I noted that the absence of the spinner had stolen only about 5 miles per hour from the indicated airspeed and we were still going like a house afire. I had just passed the town of Grafton and was still level at 3000 feet, when I felt the first tiny vibration. I had only time to check my instruments when a second later the vibration suddenly became violent, so violent that I had no doubt that the engine was going to tear itself from the mount if I didn't do something quickly. The instrument panel was just a blur, with instruments unreadable and oil now streaming back over the windshield. I instinctively knew that coming down with a dead engine was far better than coming down with no engine at all and my hand shot forward to pull the mixture. At the same moment I pulled the mixture there was a terrific bang and something departed the front of the airplane, from about the 2 o'clock position on the nose. As the engine stopped the thought flashed through my mind that a piece of the cowling had shaken loose and left the airplane, but I couldn't confirm it because oil now coated the windshield and I had no forward visibility. As I slowed the airplane to best glide speed I glanced out either sides of the canopy and felt my heart fall, because I was now over some of the most inhospitable terrain in this part of the state. I was flying in the area of Tygart Lake, where steep wooded hills impounded the waters of the Tygart River and a panoply of stark, jagged folds of earth extended in every direction. There wasn't a spot within reach for a helicopter landing, never mind a place to put the Cassutt. At the foot of each dramatic, forested hill another hill began to rise with scarcely room between for a road or a creek. I was in deep dodo and I knew it and it seemed to me at that moment that I had used up my luck and grace from God on the last forced landing and I was on my own on this one. As I searched the horizon desperately for some place, any place, to put the airplane, my eye caught a glimpse of green several miles to the east of my position, shinning in the sunlight. I knew the distance to it exceeded the gliding range of the crippled airplane, but I had no other options, so I banked the little ship in that direction. As the seconds ticked by I was puzzled at the shallow glide angle the airplane was maintaining. Perhaps I could glide that far after all. I was familiar with the dead engine gliding characteristics of this airplane from the landing I'd made the week before, but now it was gliding like a different airplane. Soon I realized that I was indeed going to make the field I had chosen; in fact I was arriving with too much altitude. I aligned my path with the longest span of the field, which appeared to be a fenced pasture of about 1500 feet in length, relatively level, with open approaches. I was slipping the airplane to give me forward vision out the side of the canopy and now I saw I was going to be too high and I would overshoot. With the knowledge that it was better to chance a crash trying to get into a field than crash for sure overshooting one, I put the airplane in a vertical forward slip, literally falling out of the air and pulled out of the slip at the last second, simultaneously flaring for the landing. The airplane floated for a second, then touched the grass. With the stick hard back and the brakes almost locked, I saw through the left side of the canopy, a fence angling towards me. I ruddered the little ship to the right and continued maximum braking until I came to a rocking, skidding stop. I sat for a second, surrounded by green tinted silence, thanking God for once again, pulling my fat from the fire. It was hard to believe that for the second time in six days I had survived another forced landing in this airplane. I knew at that moment that I was through with the Cassutt and I made a promise to myself that I would not give this beautiful demon a third chance to kill me. I swung the canopy open, unbuckled my belt and stood up. Cattle were lowing as they swayed toward me from all points of the pasture. As I hopped down from the wing they were forming a curious but respectful circle around the airplane and filling the air with their bawling complaints of a UFO's presence in their pasture. Once on the ground, I walked to the front of the airplane and got a shock. No wonder the airplane had glided so well I thought, the propeller was gone! The magnificent, paddle-bladed, scimitar shaped, wooden propeller was gone, completely gone, along with the bolts that had held it to the engine. I flushed with shame as I realized what a fool I'd been for not listening to what the airplane had been trying to tell me. I realized too late that the aerobatics that we'd been doing had compressed the wood around the washers and bolts securing the prop to the crankshaft until it had become so loose that a harmonic wobble had occurred and sheared the bolts. If we had simply checked the bolt torque after the spinner incident this near disaster would have been avoided. As I was standing by the airplane berating myself, the noise of an approaching vehicle registered on me. I looked toward the north end of the pasture and a grayed head appeared, rising smoothly and majestically over the hill, as if born by magic. It was followed quickly by the shoulders and upper torso of an old woman. Next came the farmer, carried along by the same magic, and then the tractor itself appeared, with the farmer clinging to the steering wheel and his wife standing on the spreader bar behind him. "See Pa," I heard over the noise of the engine, "I tol you somethin was bothern' them cows"
After introductions were accomplished and I had given a brief description of what had brought me to their farm, we wrestled the airplane into an equipment shed located at the edge of the pasture. We then secured fencing across the front of the shed to keep the cows from munching on the airplane's fabric as cows are wont to do. Now afoot, I welcomed the farmers offer to give me a ride somewhere, and after orienting myself I realized that I was only a few miles from the home of my Uncle Harold in Nestorsville. We arrived at my uncle's house just as darkness was falling. I rang the bell and as the porch light came on I realized that my sudden appearance in my present state must look very strange indeed. I was covered with the cow poop the wheels had sprayed on the side of the airplane while landing and which I'd applied liberally to me in wrestling the airplane into the shed. I was without a jacket and the evening had turned chilly. I had no shoes on, but I was wearing socks. For a moment after he opened the door my uncle just stared at me in the reflection of the yellow bulb. "Why Stevie" he then said, "what happened?" I never did fly the Cassutt again, but we did rescue it from the field where it came to earth, and trucked it back to Morgantown one bright November Sunday morning. Eventually it was sold and I lost track of it, but in the years since,I've thought about that little piece of my past. I've wondered where ended up and who owns it now, but most of all I've wondered if there was ever a third dead stick landing for the pilots who followed me.